The health of our economy cannot be separated from the health of our environment. The myth that we have to choose between the two is peddled by forces opposed to increased environmental protection and effective climate action—forces that stand to profit from destructive megaprojects and the endless extraction of finite resources. And let’s face it—they have been quite successful at it: the myth endures. So it’s worth asking ourselves, have we been unwittingly perpetuating it, instead of undermining it? 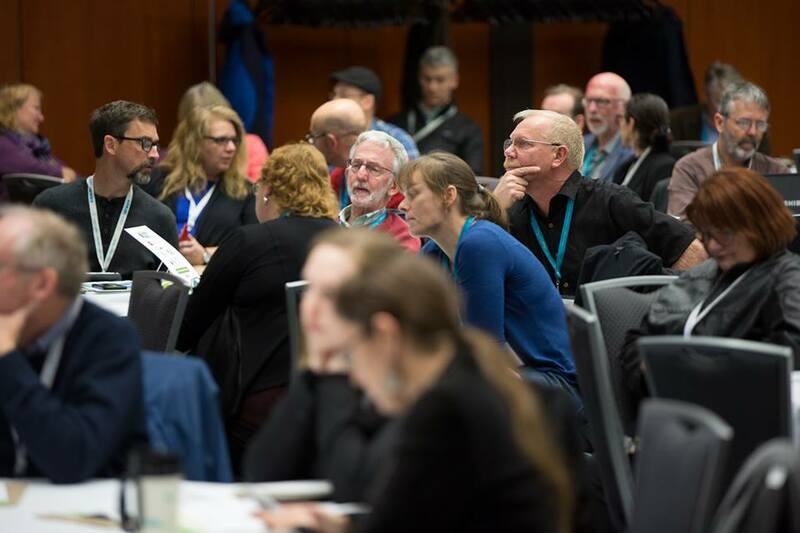 Jobs Today, Jobs Tomorrow: BC’s Green Jobs Conference 2016. Photo courtesy of Green Jobs BC. When we, as environmental voices, focus too much on what we are against—be it the logging of old growth, or fracking, or an oil pipeline—and neglect to talk about what we are for, we play into the hands of our opponents. We are then pitted against resource-dependent communities, the unemployed, underemployed and marginalized, and those who fear for their economic security. The media build this narrative by highlighting stories featuring conflict, as this is what attracts the audience they want. Environmentalists—often disproportionately urban, middle class and white—have been successfully caricatured as a privileged cohort who can “afford” to oppose development, while less fortunate folks must suffer the consequences in the form of lost opportunities and jobs. And yet the reality is that we are all in this climate change boat together. To steer a new course we need everyone’s skills and expertise, solutions that work for everyone, and everyone’s buy-in and support. To achieve long-lasting solutions, we need to build a broad and sustainable political consensus on the need for action. All of society needs to work together for a future that supports sustainable jobs in a healthy environment, a future that leaves no-one behind. That’s why Sierra Club BC’s participation on the Steering Committee of Green Jobs BC is so important. Green Jobs BC is a coalition of environmental organizations and organized labour. The coalition shares a vision of an inclusive, sustainable economy that provides good jobs, is socially just, protects the environment and reduces carbon emissions. 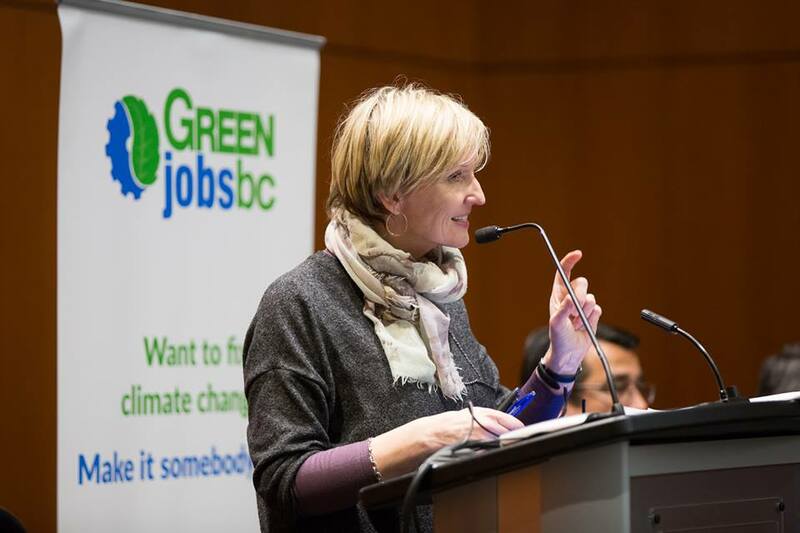 Late in November, I attended the Green Jobs BC conference in New Westminster. Some of the most interesting discussions I had there were around the concept of a “just transition” to a post-carbon economy. What is a just transition? A just transition means that the burden of change will not be placed disproportionately on a few. It means that those who are most vulnerable to change will be protected. It means that the process of shifting to a post-carbon economy will increase social justice for workers, women, the poor, and all oppressed groups. A just transition is essential to achieve and maintain the broad political consensus necessary to allow climate protection policies to work in the long run. 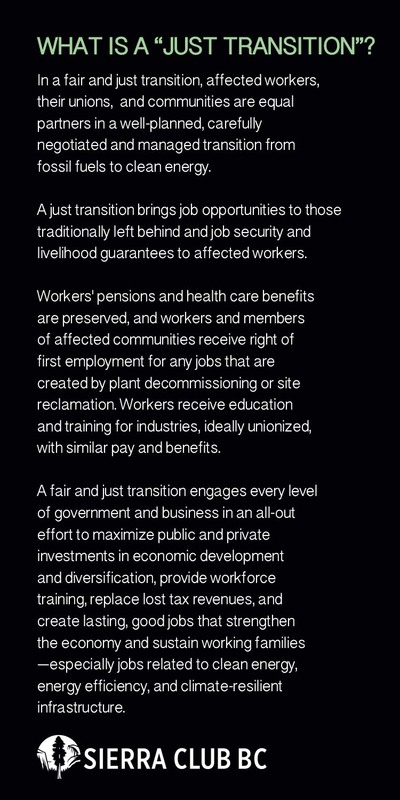 Many attendees from organized labour pointed out to me that all too often mere lip service is paid to the concept of just transition. Irene Lanzinger, President of the B.C. Federation of Labour, asked me what I think would happen if a displaced worker who used to earn $40 an hour was told they will get retraining, but that training qualifies them for work that pays half as much. Well, pretty clearly, that worker isn’t going to buy into this plan. That worker will see the transition as anything but just for him or her and their family. This is one of the reasons why we as a society have to take the concerns of workers seriously as we tackle climate change. And that is why environmentalists, labour and social justice advocates must work together, just as we are through Green Jobs BC. We need to find climate solutions in which workers in all parts of the province can see a secure future for themselves; a shared vision that will inspire all of us to put our shoulder to the wheel and make happen. How do we do that? Those of us who identify more as ‘environmentalist’ than ‘worker’ can start by listening and learning, to ensure that what we are asking for is more inclusive. We can study labour history, and learn the ways that unions have improved the rights of all workers over the decades. We can organize in our communities in ways that build relationships with union locals, incorporate diverse views and voices into the changes we are calling for, and invite workers to our events and rallies. In turn, we can start showing up in support on picket lines or finding other ways to show our solidarity. The exploitation of the environment is intimately tied to the exploitation of workers. The quest for profit above all other values has driven the erosion of worker rights just as surely as it has the erosion of environmental protections. “Nothing about us without us” is organized labour’s refrain. When we as environmentalists include workers in our discussions, strategizing and actions (and vice versa), we will build dialogue, trust and ultimately a powerful alliance. And out of that alliance we can build the broad political consensus necessary to allow climate protection policies to work in the long run.